Fr. 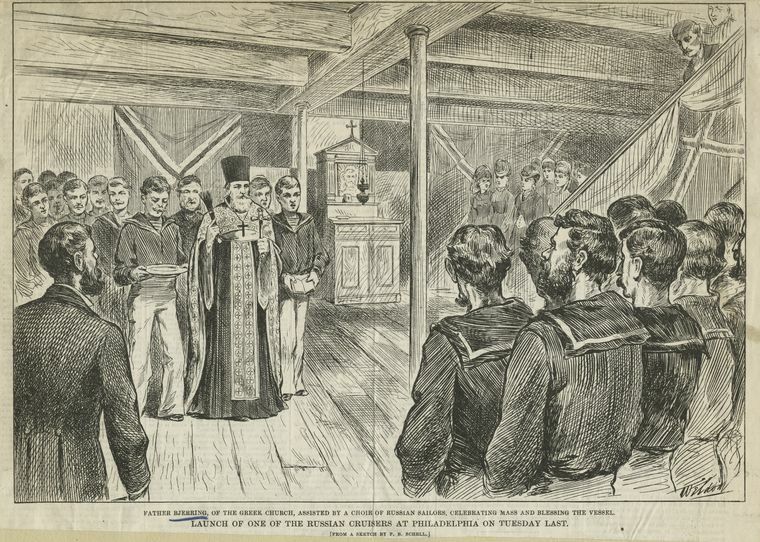 Nicholas Bjerring blessing a Russian ship visiting Philadelphia. Photo from the New York Public Library's Digital Gallery. May 4, 1793: Empress Catherine the Great of Russia granted the Holy Synod permission to establish an Orthodox mission in “Russian America” (Alaska). The following year, the first eight missionaries, including St. Herman, arrived on Kodiak Island. May 3, 1870: Nicholas Bjerring, a convert from Roman Catholicism, was received into Orthodoxy by chrismation in St. Petersburg, Russia. He was then ordained a priest and sent to New York, where he established a Russian Orthodox embassy chapel in the city. Bjerring, the first significant Orthodox convert in the United States, served the chapel for 13 years, acting as a kind of religious ambassador to America. But by 1883, the Russian government decided to cease funding the chapel, and Bjerring was offered a teaching position in St. Petersburg. He declined and instead became a Presbyterian minister. At the end of his life, he re-converted to Roman Catholicism. May 5, 1892: St. Vladimir’s Russian Orthodox Church was established in Chicago. This came just weeks after Annunciation Greek Orthodox Church was founded in Chicago, and it marked the first instance of “overlapping jurisdictions” in the same city — a trend that became ubiquitous in the decades that followed. A few years after this, a young priest named John Kochurov was assigned to the church; in Kochurov’s tenure, the parish name was changed to Holy Trinity, and a magnificent new cathedral (designed by famed architect Louis Sullivan) was constructed. Kochurov eventually returned to Russia and was martyred by the Bolsheviks, and has since been canonized. As for his old parish, it survives today as the seat of the OCA Bishop of Chicago, and is one of the oldest continuously functioning Orthodox parishes in the Western Hemisphere. May 5, 1902: This was the 10th anniversary of the founding of the Chicago Russian parish, but nobody was celebrating that day, because the church’s quarter-ton bell was stolen. The whole Orthodox community of Chicago — including the Greek parish — searched for the bell, but as best I can tell, it was never recovered. Two years ago, I wrote an article about the bell’s theft; CLICK HERE to read it. April 30, 1905: Pascha, gunshots, a New York cop, and a mob of Greeks. The short version is that, on Pascha in New York, a Greek man fired a gun in celebration — not exactly a unique occurrence. But a police officer arrested the man and started taking him away, whereupon 500 or so Greeks, who had been in the middle of a Paschal procession, diverted course and followed the officer. The mostly peaceable (but assuredly frightening) mob threw the cop to the ground, freed the prisoner, and then apparently went back to celebrating Pascha. It’s kind of a bizarre story, and I covered it in more detail two years ago. CLICK HERE to read more. May 2, 1914: Bishop John Mitropolsky, former Russian Bishop of the Aleutian Islands, died. Bishop John was the man responsible for moving the diocesan headquarters from Alaska to San Francisco. It’s difficult to overstate the importance of this move. I don’t know for sure, but it may be the first time that the official seat of an Orthodox diocese was located outside of the formal diocesan boundaries. I’m not sure what those calendar changes were, but these changes were an obvious attempt to find common ground with the West — particularly the Episcopal Church. Bishop John was reassigned to a post in Russia in 1877, and he died in 1914, at the age of 77. 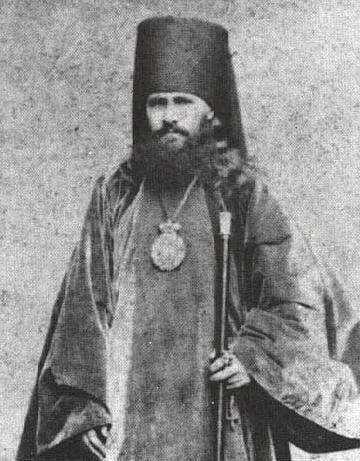 May 5, 1916: Agapius Honcharenko, one of the strangest men in American Orthodox history, died in Hayward, CA. We’ve talked about Honcharenko quite a bit on this site, and I did a podcast on him a few years ago. May 4, 1945: On Holy Friday, St. Vasily Martysz was brutally murdered in Poland. As a young priest, he had served in America from 1901 to 1912. The Orthodox Church of Poland canonized St. Vasily in 2003. To learn more, read this life of St. Vasily, written by Fr. Michael Oleksa. May 6, 1967: Theodosius Lazor was consecrated Bishop of Alaska in the Russian Metropolia. A few years later, the young bishop represented the Metropolia in Moscow, where he formally received the Tomos of Autocephaly from the Moscow Patriarchate. This created the “Orthodox Church in America,” and in 1977, Theodosius was elected the jurisdiction’s primate. He served as Metropolitan until 2002. May 6, 2006: A landmark All-Diaspora Council of the Russian Orthodox Church Outside of Russia opened. This council went on to formally approve the reconciliation between ROCOR and the Moscow Patriarchate, which had been estranged for decades.